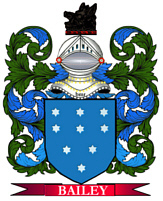 Coat of Arms: Blue shield with a gold saltire. between four figures it is said to be cantoned. Saltire-per. 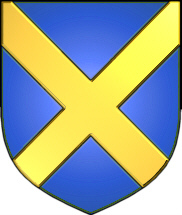 Applied to the field of a coat of arms, or any charge when divided by two diagonal lines crossing each other. 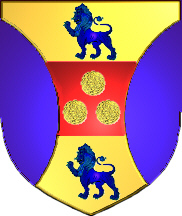 Coat of Arms: A gold shield with three bezants on a red fesse between two blue lions passant guardant, and two blue flaunches. Flanch, Flanque, Flasque or Flaunche. Is an ordinary made by an arched line that swells towards the centre, and is always borne in couples. The diminutive of the flanch is the Voider; it resembles a Flanch, but is not so circular toward the centre of the field, and it should be depicted much less in breadth. Motto Translated: By fidelity and fortitude. 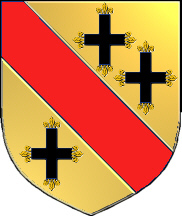 Coat of Arms: Gold shield with a red bend between three black crosses decor ated with flowers. 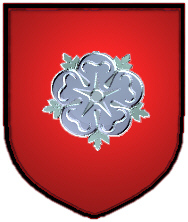 Coat of Arms: Red shield with a silver rose.